The data collected by Citizen Science Leaders (CSLs) is providing vital information on the health of our planet’s freshwater, and improving our understanding of how water bodies behave. Earthwatch is pleased to reveal the findings so far. Combining satellite data and CSL data improves waterbody predictability. FreshWater Watch scientists have analysed over 15,000 datasets, representing more than 2,500 water bodies. Some of the preliminary findings confirmed the assumptions of the scientists, while others were more surprising. Most importantly, all the data collected by CSLs so far is proving valuable for informing the management of water conservation worldwide. The data indicates differences found within ‘lentic’ and ‘lotic’ water bodies that appear to be globally consistent. Lentic waterbodies are still water ecosystems, like lakes and ponds, while lotic water bodies are those with running water, like rivers and streams. CSLs have been detecting dissolved nutrients - phosphates and nitrates - in both types of water bodies. Aquatic plants need these nutrients to grow, but if too many nutrients enter the waterbody - from wastewater or agricultural fertilisers for instance - they can be harmful to the health of the waterbody. The FreshWater Watch findings so far show that, based on data from 32 urban areas on four continents, nitrate levels tend to be higher in running water bodies. Phosphate levels also generally seem to be higher but the information is less clear. This global consistency is an interesting finding which our scientists aim to study further. When a water body gets too many nutrients, the microalgae (phytoplankton) in the water can thrive, creating ‘algal blooms’ which if left unchecked can stop sunlight and oxygen getting to the wildlife below the water. In some cases, excessive micro-algal growth releases toxins that can make the water dangerous for humans and animals that drink from it. Analysis of the FreshWater Watch data confirmed the scientists’ hypothesis that algal bloom events generally occur in higher levels in still waters than in moving waters. This is probably because micro-algae in still waters is less impacted by currents. This finding, made possible by CSL data, is especially useful, because environmental and water agencies often need information on when and where algal blooms occur in order to reduce their frequency and duration. CSLs also analyse turbidity - the cloudiness of water caused by individual particles such as sediment or microalgae. It was thought that turbidity levels might be higher in lotic waterbodies, because of factors such as materials from local catchments falling into the water. But new CSL data suggests that turbidity levels are in fact higher in lentic waterbodies. The scientists think that algal blooms might be having a dominating impact on turbidity, and aim to explore this relationship further. The FreshWater Watch scientists are gathering all the ‘research parameters’ that CSLs study - nutrient levels, turbidity etc - into an ‘impact index’. This means that they are able to compare these findings alongside the other particular elements of each waterbody thanks to further observations that CSLs have made. For instance, it seems that visible pollution sources - such as pipes leading into the waterbodies - have a notable effect on the quality of the water: the higher the number of visible pollution sources, the poorer the water quality. Also, where there was no vegetation on the banks, the water quality was generally found to be poorer. This might be because terrestrial plants help to ‘use up’ nutrients, preventing them from reaching the water making the water body cleaner. The scientists are also taking CSL data, and placing it alongside satellite imagery which tells us about factors such as hydrology, weather and population density. This helps us to set a context for your data. Using this combined local ‘micro scale’ and satellite ‘macro scale’ data, we can improve our ability to predict how still water bodies will behave over time. 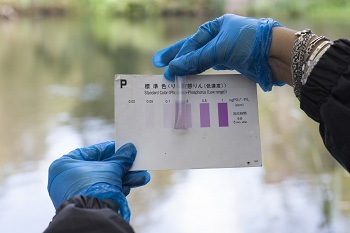 For running water bodies, it’s not quite as clear just yet, but we aim to investigate these preliminary results further. Thank you – and keep going! Some of these preliminary results may sound like common sense, but in fact the statistical proof provided by the data collection of CSLs is absolutely vital, because it gives us tools to inform conservation management - such as knowing the effectiveness of green spaces near water bodies, and ‘buffer strips’ near farms which may help reduce the nutrient loads from agricultural run-off that might otherwise end up in our water. So it’s thanks to you that we are able to make steps towards preserving our planet’s fresh water. We need more data to make our findings more robust, so keep testing your local bodies, and keep uploading your data. You can also help by recruiting more CSLs from your colleagues. We love to hear about your experiences too. Keep in touch in our forums and blogs, and keep an eye out for further FreshWater Watch findings.